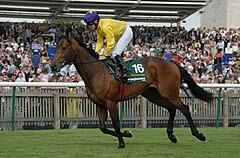 Sea The Stars himself won the 2009 Investec Derby amid an outstanding three-year-old campaign that brought a total of run of six Group One victories before his retirement to stud. His first progeny will contest a prize worth at least £1.325 million at Epsom Downs on Saturday, June 7, 2014, in the 235th running of the world’s most famous Flat race. Sea The Stars’ entries include the first-foal of Japanese star mare Vodka, whose seven top-level successes included the Japan Cup, a 1.2 million euros colt out of 2009 Prix Jean Romanet winner Alpine Rose who topped the Arqana August Sale, and sons of the 2000 and 2008 Investec Oaks heroines Love Divine and Look Here. Sea The Stars’ owner Christopher Tsui has six of the sire’s yearlings entered. Sea The Stars’ half-brother Galileo, regarded by many as the world’s best stallion, has 52 entries including Qatar Racing’s 2.5 million guineas purchase Hydrogen, the most expensive yearling sold at auction this year. The three-parts brother to 2007 Investec Derby hero Authorized is set to go into training with Peter Chapple-Hyam. Another eye-catching entry is Primogeniture, the first foal of four-time Indian Classic heroine Jacqueline who is in training with John Oxx in Ireland. Godolphin’s 68 initial entries include a New Approach colt out of 2002 Investec Oaks winner Kazzia, and a Street Cry colt out of US Grade Two scorer Serenading, who sold for $1.2 million at Saratoga in August. Camelot and Pour Moi have captured the past two renewals of the Classic for the Coolmore partners Sue Magnier, Michael Tabor and Derrick Smith are responsible for 56 entries between them. Among their contingent is the Galileo colt out of dual Group One winner Red Evie and another Galileo colt out of multiple Group One scorer Alexander Goldrun, who was purchased for 950,000 guineas at Tattersalls. Other notable purchases for the Coolmore team, who also landed the Investec Derby with Galileo (2001) and High Chaparral (2002), include a 525,000 guineas Galileo colt out of 2004 Investec Oaks heroine Ouija Board. The Aga Khan has also enjoyed four Investec Derby triumphs with Shergar (1981), Shahrastani (1986), Kahyasi (1988) and Sinndar (2000) and he has 19 entries for the 2014 Group One spread between Alain de Royer-Dupre and Mikel Delzangles in France plus John Oxx in Ireland. Hamdan Al Maktoum, whose famous blue and white silks were carried to victory by Nashwan (1989) and Erhaab (1994) at Epsom Downs, is well represented with 23 entries including Almuhalab - a Dansili colt out of 1,000 Guineas and Coronation Stakes winner Ghanaati, who goes into training with Charlie Hills. A star-studded entry includes Throne Room, an Oasis Dream half-brother to Nathaniel and Great Heavens, and many expensive yearlings including an 800,000 euros Galileo colt out of Flames in training with Tommy Stack. Andrew Cooper, Director of Racing at Epsom Downs Racecourse, commented: “The first entry for the 2014 Investec Derby not only includes the very best bred yearlings in Europe but the race’s global appeal is exemplified by the fact that colts out of Indian and Japanese champion racemares are engaged. The figure of 406 entries is 32 less than last year but, for the fourth year in succession, the number of entries is over 400. The recent entry numbers for the Investec Derby are as follows: 2014-406; 2013-442; 2012-478; 2011-444; 2010-388. Investec, which has sponsored the Derby since 2009, last year announced an extension to the Derby Festival sponsorship until 2021.